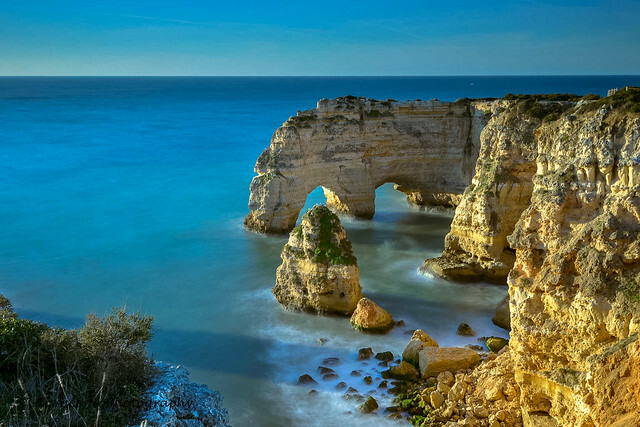 Portugal’s Algarve region is an alluring mix of historic cities, pretty seaside villages and beautiful national parks. But without doubt it’s the wealth of beaches and hot sunshine in which to enjoy them that attracts vacationers from around the world. With beautifully clean stretches of gold and white sand plus the warm Mediterranean climate it’s no wonder that Mirror.co.uk voted the Algarve as one of the top vacation spots in South Europe. When deciding where to stay in The Algarve, you’ll need to decide what it is you’re most interested in – Surfing? Swimming? Adventure? Culture? Nightlife? Whatever your travel style, you’ll find an area of the Algarve that suits you. Praia da Marinha in the central Algarve region is regarded as one of Europe’s best beaches and the amazing giant rock formations jutting from the sea only add to the atmosphere of this beautiful spot. Clear, shallow waters lap gently against the bay cliffs and the white sands are the ideal place to simply relax for the entire afternoon. This is a secluded beach area with little in the way of restaurants and cafes; there’s only one beach kiosk from which to purchase some ice cream or a cold drink. But if you’re a fan of snorkelling, swimming and sunbathing, and want to avoid the crowds, then this will be the place to come. The surfing may not be as good here as the surfing in Hawaii, but if you’re a windsurfer or body-boarder then you’ll no doubt have heard of Praia do Martinhal located in the Bay of Baleeira. This is a reasonably sized Blue Flag awarded stretch of sand but the continual winds are what makes this beach an attractive proposition for surfers; a surf-school is located here for those who wish to take lessons. Praia do Alvor in the central region is another excellent beach for wind-surfing and this huge stretch of sand is just an easy walk from the many of bars, restaurants and nightclubs located in Praia da Rocha, but make sure you’re back in time for the gorgeous sunset at Praia da Rocha! You’ll find plenty of activities on this calm and relaxing Blue Flag beach including water-skiing and sailing. The Algarve has its fair share of stunning little islands. You can check out Thomson for flights to Faro if you want to experience Ilha da Barreta, which consists of nearly 10Km of pristine golden sands. The pedestrian-only Armona Island in the east is another idyllic little spot that is perfect for day trips to enjoy the secluded swathes of sand on the Atlantic coastline. You can reach the IIha da Culatra by taking a 30 minute ferry from the town of Olhao and many regard the beaches here as the best you can find in the Algarve. Finally, Tavira Island stretches for 11Km by only 1Km and this huge Blue Flag beach is a safe haven for naturists and you can actually camp overnight here in the designated park areas. The Algarve will easily provide you with a beach to meet your mood whether that’s a lively resort or a more remote area where you can relax in peace. If you’re an outdoors lover then you’ll be hard pushed to find a more diverse range of beaches to explore and enjoy in Europe. Rebecca Hurt is an adventure seeking biology graduate, currently travelling around the globe. She likes photography and wildlife. Images by Luis Ascenso Photography and Tiago J.G. Fernandes, used under the Creative Commons license.